Playing music has always been a big part of my life, but in 2000 I bought my first Sitar and that became my main instrument. Since then, I’ve been actively studying, learning and performing North Indian Classical music. In 2004, I received my BFA in World Music from California Institute of the Arts with a major in Sitar and minor in African dance studying with numerous masters including Rajeev Tarnanath, Swapan Chaudhuri, Kobla and Beatrice Ladzekpo. To further my study in North Indian classical music, I receive training from Parthada Chatterjee in both India and the United States. 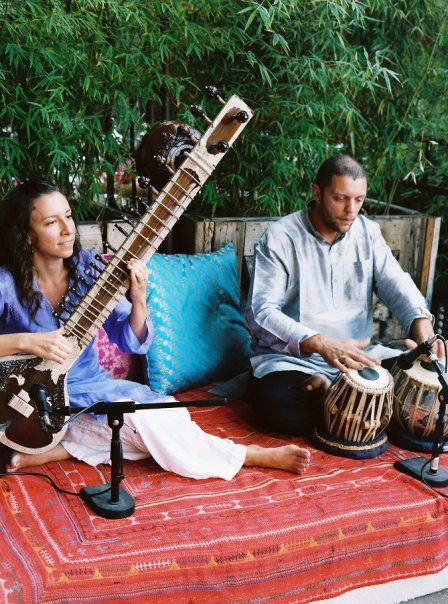 In the spring of 2007, I performed in a 13 city European tour with Anoushka Shankar and in 2009 /2010 toured throughout the US with Anoushka and Ravi Shankar playing tanpura accompaniment. In addition, in 2012 I played sitar on the sound track to the film, ‘The Life of Pi’. Today I am working on different musical projects and perform publicly, or for private events with my husband Andrew (who is a member of the world renowned percussion group Hands On’Semble) in a Sitar and Tabla duo. Check out the five tracks below to enjoy a demo and recent collaborations with Celeste Lear, Mac Quale and Fumosonic. Courtney and Andrew recently performed at our residence. This was a no occasion party for friends, mostly Indians and Pakistanis. All were amazed by the great performance of Sitar and tabla, which is mostly an Indian heritage. They are very professional and pleasant, and added an especial ambiance. I highly recommend them for any occasion.